Dealing with the Unexpected: What happens when a woman’s ovaries stop working before they should? In my recent blogs on legal issues that arise in relation to aspects of women’s health, I discussed the difficulties women can encounter when they undergo hysterectomy surgery or suffer pelvic organ prolapse. These are issues that usually arise in women in their post menopausal years, and after the age of 50. As a clinical negligence solicitor with a specialist interest in female health issues, I act for women who have been diagnosed with a wide range of medical conditions. Some of the rarer, or less well-known conditions, can have just as significant an emotional and physically effect. These conditions often come as a huge shock to the patient. There can be a frustrating and long delay before diagnosis, and there is often a lack of understanding or appropriate support from medical professionals. One such lesser-known condition is “Premature ovarian failure” (POF). This occurs when a woman’s ovaries stop working properly at a much earlier age than expected, usually before the age of 45. This can be associated with the early onset of menopausal symptoms, which can be both traumatic and alarming for the woman concerned. Why does Premature ovarian failure Happen? Chromosome Abnormalities – if women suffer from conditions such as Turner syndrome or Down’s syndrome. Enzyme Deficiencies – when different enzymes in the body affect the ovaries. Autoimmune Diseases – when the body’s immune system essentially destroys its own tissues. Cancer Treatment – such as chemotherapy and radiation therapy. The effect is dependent upon the type of treatment and the patient’s age. Infections – such as tuberculosis and malaria, however this is quite a rare cause of POF. Surgery – for example a hysterectomy or removal of the ovaries. The symptoms outlined above can be difficult to talk about. Women often endure distressing symptoms because of embarrassment, or because they think that their symptoms are normal for their gender, something to “put up with”. What are the risk factors for the condition? Age – the risk for POF increases sharply after the age of 35. Family History – a family history of the condition is a red-flag for its re-occurrence. General fertility issues in the family are also a risk factor. A blood test checking your level of FSH (follicle-stimulating hormone) is the usual test to diagnose potential ovarian failure. Your GP may also arrange for alternative tests to confirm the diagnosis, and/or refer you to a gynaecologist for specialist advice. Women whose ovarian function is reduced from an earlier age are at a higher risk of osteoporosis. 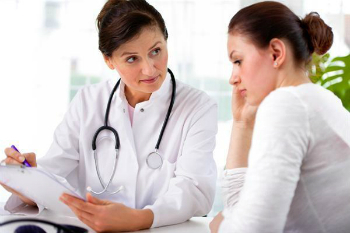 Bone scans are recommended for anyone diagnosed with premature ovarian failure. Women can be more susceptible to fractures, and a calcium rich diet with calcium supplements is recommended. The most significant effect of premature ovarian failure, however, is the possibility of infertility. This can obviously be incredibly upsetting for the patient, and can lead to long term psychological consequences. Coming to terms with infertility can be a difficult process, and it is very important that women seek appropriate support and counselling. GPs should be able to suggest local support groups or networks with which women can talk to about their diagnosis. These are often a huge source of comfort. Though POF cannot be cured, or reversed, there are a number of ways to relieve the symptoms of the condition. Simple changes in diet and lifestyle to include healthy eating and adequate exercise can often reduce milder menopausal symptoms. For treatment of more severe symptoms, Hormone Replacement Therapy (HRT) may be prescribed to replace reducing levels of oestrogen in the body. HRT can take a number of forms e.g. a tablet or gel, but it does have its own potential risks and side effects like any medication. Women should discuss the balance of risks and benefits with their GP or treating gynaecologist to ensure they make an informed decision about whether to use HRT. If women are struggling with particular symptoms e.g. low mood or anxiety, vaginal dryness, medication can be prescribed to ease these, to use in either the short or long-term. NICE is due to publish guidelines for health professionals on the diagnosis and management of the menopause in November of this year. The guidelines will also specifically address the diagnosis and treatment of premature ovarian failure. This will be a welcome development for both healthcare professionals and women dealing with the condition. Elevated FSH levels should be monitored on 2 blood samples taken 4-6 weeks apart; a diagnosis should not be made on the basis of one blood test. This treatment caused you to suffer an injury that you would not have otherwise suffered, had you received appropriate care (this is called ‘causation’). A delay in treating premature ovarian failure, which can lead to prolonged menopausal symptoms and development of osteoporosis. Due to the non-specific symptoms of premature ovarian failure, they may not be given adequate weight by GPs, or looked at collectively with a woman’s family history. If this happens, and premature ovarian failure is diagnosed later than it should have been, it is likely that the GP would be found to be negligent for failing to investigate such symptoms further. In claims for compensation relating to premature ovarian failure, it can be less straightforward to prove that the negligent treatment injured the patient, beyond those symptoms that would be suffered in any event. However, earlier diagnosis and medical intervention are important in addressing the progression of menopausal symptoms and/or infertility. In order to prove a medical negligence claim, you must show that the outcome would have been different had you been treated appropriately. Whilst the aim of a legal claim is to recover financial compensation, at Bolt Burdon Kemp we recognise that access to practical help and support services is also incredibly important. We will endeavour to provide you with the best advice on both. There are specialist charities to help support patients and their families following a diagnosis of premature ovarian failure. The Daisy Network is a charity which is widely praised for being a wonderful source of support, as well an important network for women to share their experiences on dealing with the condition. The Daisy Network’s website is also extremely informative. For a first-hand account of POF diagnosis as well as expert advice on the symptoms, view the video below. Katie Mulroy is a clinical negligence solicitor at Bolt Burdon Kemp with a special interest in claims involving women’s health issues. If you or a loved one are concerned about the treatment you have received, contact Katie free of charge and in confidence on 020 7288 4853 or at katiemulroy@boltburdonkemp.co.uk for specialist legal advice. Alternatively, you can complete this form and one of the solicitors in the Medical Negligence team will contact you. You can find out more about the team.